The 11th JEC Asia will take place in Seoul on 14 - 16th November 2018. The 2017 event saw three days of intense business deals with more than 230 exhibiting companies from Asia, Europe and America being represented. The event was organised over three floors of the COEX Exhibition Centre of Seoul and saw a record number of 6,271 professional visits from 42 countries, the top visiting countries being South Korea, China, Japan, Taiwan and France. The event celebrated the 10th anniversary of JEC Asia and marked a real turning point for the composites industry in Asia Pacific, welcoming professionals from composites-using industries such as Aerospace. Automotive, Electronic & Electric Equipment, Construction, Sport & Leisure and many more. Based on the success of the 2017 event JEC has doubled the floorspace which will now be on one level and will accommodate more exhibitors and innovative parts in 2018. Composites UK members receive a 10% discount on exhibition fees when exhibiting in the UK area (e.g. 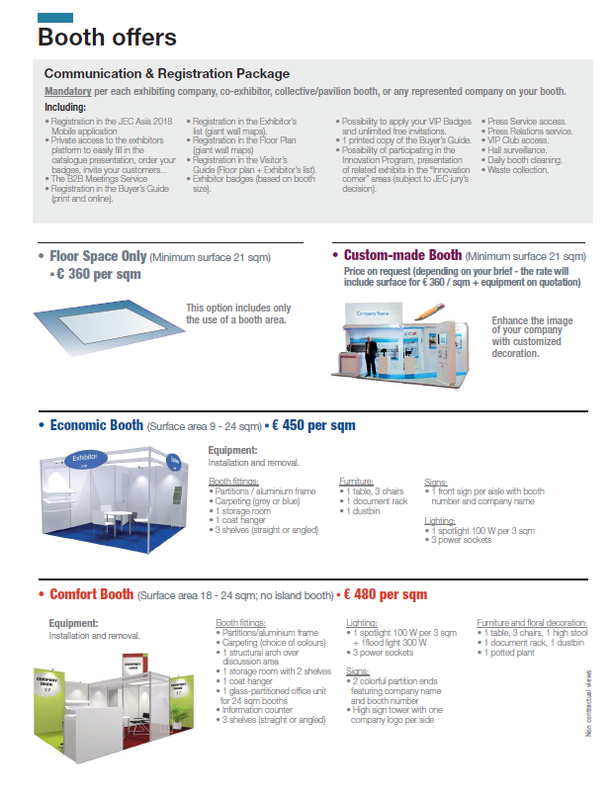 €4050 instead of €4500, for a 9sqm Economic Booth, price includes the €450 compulsory registration and communication package). Click here for details and contact Lin Zhu, International Sales Manager – JEC Asia to discuss (Tel: +33 (0)1.58.36.15.75).